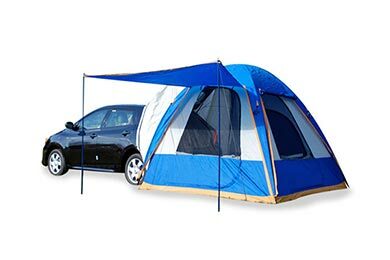 Read 373 customer reviews about Truck Tents that have an average rating of 4.5 to find out what product is best for your vehicle. This is a fantastic product. The tent goes up very easily--ten minutes or so--and the sleeve that fits over the hatch of the van works SO well--we just had a great first-time trip with it, and it took all of 30 second to detach and drive out for a nice dinner--then re-attach when we returned (takes some careful backing to get centered with the tent again). 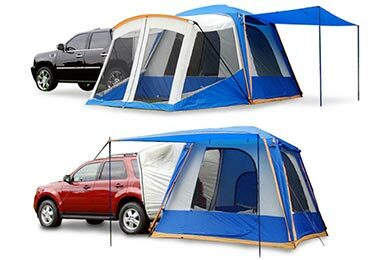 So what if the tent does not fit easily back into its carrying case? What tent ever does? We keep ours in one of those large blue Ikea shopping bags--it is the perfect size. Or just slip it into a large plastic bag. Finally--AutoAnything is GREAT! They had the tent to us almost instantly. The instructions are not that easy for the "non mechanical" however once you figure it out it's easy. The customer service of the Napier company is amazing. They helped me fix my problem and they also have a Facebook page. My tent fit my truck perfectly. This was questionable because I have an older, 3/4 ton Dodge p.u. with a tool box. 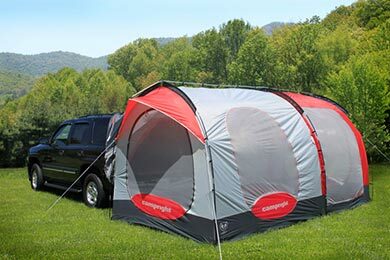 The tent your saleman recommended fit perectly, with plenty of room to stretch out in. I love it! Deb K.
This is the easiest tent I have ever put up. It is great we even put it up in 20-30 mph wind it still went up easy we attached it to the SUV and used tiedowns on the other side, and that worked. We had no problems the rest of the night. Reference # 766-174-151 © 2000-2019 AutoAnything, Inc.